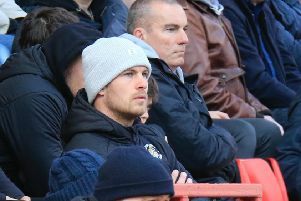 Hatters boss Nathan Jones has declared he wants nothing less than the full package from players who are going to be part of Town’s squad next season. The new chief has been running the rule over Luton’s current playing personnel since he took over in January, and believes decisions are close as to who stays and who goes in the summer. With the likes of Pelly Ruddock Mpanzu, Jake Howells, Paul Benson and Alex Lawless to name a few in their final year, Jones said: “Things like that are ongoing and they’re in house. “I pretty much know who I’d like to take forward, there are one or two exceptions that still have a bit to do or I haven’t quite made my mind up and it depends on a few things. “I’m pretty clear on moving forward, I’ve had enough time now to see the squad, I know what I need. Jones believes that the players who are playing for their futures will be doing their utmost to prove their worth during training and games too as he continued: “I think a lot of them want to prove a point in moving forward as it’s going to be a big summer for us in terms of recruitment and what we take forward, because I don’t want to be in this position (14th) in a year’s time. “So if we recruit well and the players we bring in are the right types and right characters then we won’t be. The Town chief hopes that with just five games to go this term, then players won’t all of a sudden realise their career at Kenilworth Road is at stake either, adding: “I hope the penny hasn’t dropped in the last game or two, or three or four days because I had a career of 25 years but I realised I was playing for my future every single day. “I never once sat back and thought ‘I’m okay’ for a minute. I never had a manager who actually allowed me to do that and I’m not going to allow our players to do that. “I hope we get a group of players who want to play for the shirt, want to play for me, want to play for each other and if that transcends into them playing for their future then fine.